Assistant Director Nikhil Vyas gives us an insight into how the exciting, hilarious and touching Clybourne Park is being brought to life. Clybourne Park tells the story of one house in Chicago over 50 years. We first see the house in 1959, when it’s owned by a couple named Russ and Bev, who make a shocking discovery on the eve of their sale and departure from the house. We then jump to 2009, when a couple named Steve and Lindsey have bought the house and are preparing to raze it to the ground. But at its core, Clybourne Park unforgettably confronts how a city – and a society – can never escape its past. It tackles the simmering violence of racism that lurks beneath white civilised society, and it ruthlessly exposes how greed and materialism drives us to behave in terrible ways. And it does it in a way that is wickedly, agonisingly funny. 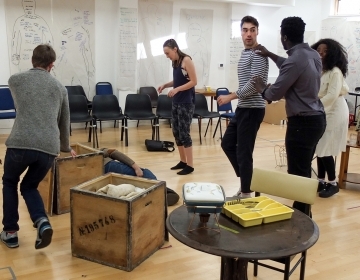 Trying to rehearse a play with this level of detail and sharpness is an almost monumental challenge – but it’s a challenge that Jenny Stephens (our director) and the incredibly talented cast have totally stepped up to. The rehearsal process began with combing through and finding endless details that reveal the characters in different lights. It’s the kind of writing where just half a line of dialogue completely flips up everything we know about the character’s world – even now, in our third week, we’re making little revelations that blow our minds. Alongside this, the cast and creatives have been bringing in truckloads of research about Chicago, its history, the racial situation in America, capitalism, housing, and so much more. 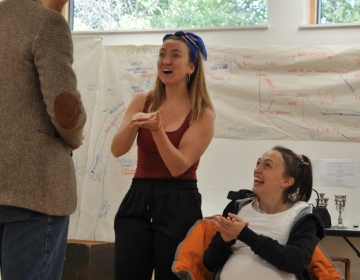 While the play speaks volumes about issues that affect us in Bristol today, it’s been of huge importance to Jenny to respect the incredibly specific time and place about which it was written. Jenny then began to put the action of the play on its feet. She’s used a number of different exercises to help the actors fully embody the language, be light on their feet and to stay laser-focused on each other. Some of my favourites include our now cherished ‘Talking Sh*t’ character game in which the actors speak their stream of consciousness, letting the lines arise from this. We are also ‘line feeding’, quietly reading the lines to the actors so that they don’t need the script in their hands as they rehearse. This is as well as the many many rounds of ‘keepie-uppie’ (a team game of keeping the ball in the air) that have helped make us a rock-solid team! We also try and find a way of ‘blocking’ the action, so that the story is being told in a way that is physical, seamless and exciting. 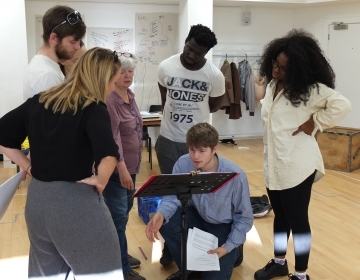 As we work through the play, and join together its seemingly endless dots, I’ve been blown away by the intelligence and dedication of the cast. While it has many side-splitting moments for an audience, Clybourne Park’s characters are dealing with a wide range of traumas, some better hidden than others. The actors always give it their all, and make decisions that create some viscerally exciting performances. As they’re double role-ing between the 1959 and 2009 timelines, this means they have to create two sets of completely different characters. Their ability to transform themselves between two sides of a millennium is pretty amazing! We’re opening in two weeks time – which, to be honest, still feels like nowhere enough to do justice to such a vibrant play. But the work that has been done so far has gone leaps and bounds into making this story a reality. Our designer, Sarah Warren, and the genius scenic and stage management teams, have worked wonders in making a story that stretches across time look totally seamless in the new Weston Studio. Having now cracked on with the next phase of rehearsals, we can’t wait to share this firecracker of a play with the Bristol community!